Dr. Kuo is a fellowship trained, board certified Anesthesiologist and Pain Medicine Specialist. He has dedicated his practice to the treatment of pain, emphasizing a non-surgical approach to acute and chronic pain with the ultimate goal of returning patients to their active lives. A focus of his practice is dedicated to Interventional Pain Management, which involves simple procedures under the direct guidance of an imaging machine. The ability of medical imaging (fluoroscopy) allows Dr. Kuo to very accurately and precisely deliver medications or block nerves that may be the source of pain, accelerating the healing process and helping to restore function. Medical School: Boston University School of Medicine, M.D. 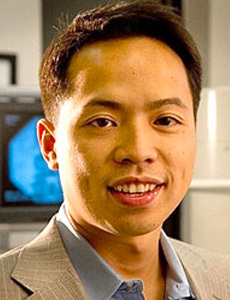 The intensive study of Pain Medicine at three of the world’s leading centers of medicine (Top Ranked Hospital in New York-NYPH, Top Ranked Cancer Center in the US-MSKCC, Top Ranked Orthopedic Hospital in the US-HSS) has led Dr. Kuo to obtain a comprehensive knowledge of different pain syndromes and conditions, ranging from sports injuries to post-operative pain to cancer pain. Dr. Kuo is a board certified Diplomate of the American Board of Anesthesiology (ABA) with additional board certification in Pain Medicine. He is a member of the American Society of Anesthesiologists, American Society of Regional Anesthesia and Pain Medicine, American Society of Interventional Pain Physicians, and Fellow of the American Academy of Pain Management (AAPM). Driven by his dedication to medicine and his specialty, Dr. Kuo continually attends education seminars and conferences and keeps up to date with the latest developments in the field of pain management. Outside of work, Dr. Kuo maintains a very active lifestyle. He enjoys cycling, golf , skiing and snowboarding, and scuba diving.